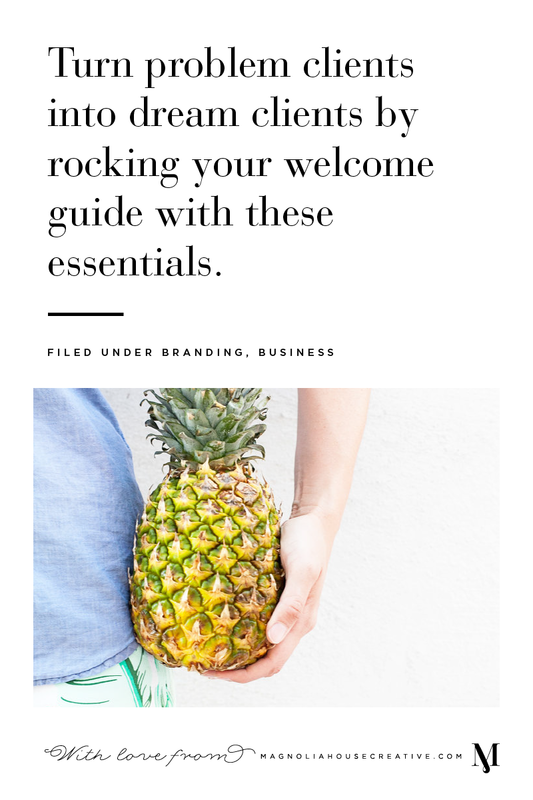 Turn problem clients into dream clients by rocking your welcome guide with these essentials. If you’re finding yourself dealing with an overabundance of difficult clients, I want to let you in on a little secret. Difficult clients are often dream clients in disguise and working with them doesn’t have to be a struggle. Why? Problem clients are often difficult because they are either nervous or confused. Your clients are dying to behave – you just need to teach them how. And this is where my very favorite client education tool comes in: The Welcome Magazine. Contrary to popular belief, a Welcome Magazine is NOT a pre-sale marketing document. The Welcome Magazine or onboarding guide is a critical resource for your clients after they’ve booked you – giving you a chance to set expectations, assuage nerves and answer common questions at the very beginning of your workflow. Nothing scares a new client more than hearing crickets (and wondering if they’re waiting on you, or you on them!). Give them a clear outline of your process, let them know when to expect more communication & deliverables from you, and if necessary, give them something to be working on in the meantime. Give your clients a quick bio of yourself, and be sure to introduce them to any team members they may be working with or contacted by. What kind of feedback is helpful, and what isn’t? How should clients provide feedback? How quickly are they expected to provide feedback? Do you recommend they involve their own villages in the feedback process, or rely on their own gut? When are payments due? How do you need to be paid? What other hard deadlines must your client maintain? What happens if a payment or deadline is missed? Give a very thorough frequently asked questions – and be sure to include the questions that you WISH your clients would ask! Remember: they may not know all the questions they should be asking in the first place. This one is especially great for wedding vendors, but either way, be sure to teach your clients any industry lingo you’ll be using throughout the process.